From that must-have new investment to our favourite boutique hotel – here’s what’s on our radar this week. TGIF. Kickstart Janurary with this delicious recipe from Madeline Shaw’s new book, READY, STEADY, GLOW Fast, Fresh Food Designed for Real Life. The sweetness of the apple really goes well with this strong-flavoured fish, but if you can’t find trout fillets you could use salmon instead. Although capers are known to be high in sodium, they add an extra burst of flavour, which is just what the fish needs. Place the cucumber slices in a colander, sprinkle with salt and let them sit for 10–15 minutes to draw out the excess water while you prepare the rest of the dish. Make the dressing by mixing the mustard, dill, vinegar and olive oil together with pinch of salt. Thinly slice the avocado and apple and throw into the dressing to stop them browning, along with the shallots, stirring well to combine. Heat the oil or butter in a frying pan over a medium heat, throw in the capers and stir for 30 seconds then move them to the edge of the pan and throw in the trout, skin side down. Sprinkle over a little salt and cook for 5 minutes until the skin is crisp, then flip the fish over and fry for another minute or so until almost cooked through. The cooking time will depend on the thickness of the fillet, but look for golden skin, a bronzed top and flesh that is opaque all the way through. Rinse the cucumber, drain and then pat dry with some kitchen paper and mix in with the salad. 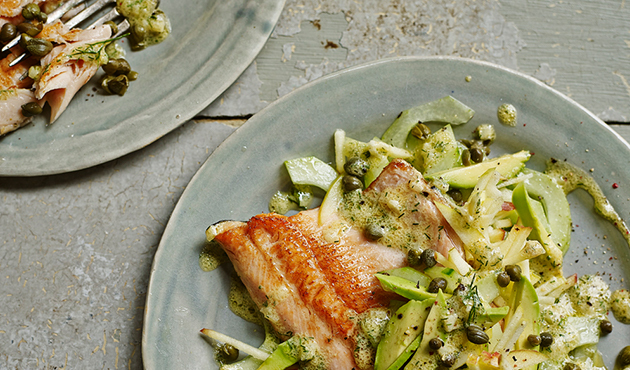 Divide the salad between two plates and serve with the fish and a sprinkle of capers. Madeleine Shaw's READY, STEADY, GLOW Fast, Fresh Food Designed for Real Life is published by Orion Books in hardback and e-book, priced €20/€10.99. Madeleine’s Glow Guides App: your own pocket personal trainer, nutritionist, life coach and much more. Available from iOS and Android stores at €49.99.